Apple was everyone's darling and as it declined, it looked to be a barometer for broader market behavior. So when it turned positive Monday, its move was encouraging but the stock was hit in late trading on comments from President Trump that he would like to put tariffs on iPhones. Traders will now watch to see if Apple can hold above $170 when it opens Tuesday. But bears want to use Apple as a warning for more weakness. So far, the bears have been winning. So, Apple's behavior Monday was seen as a glimmer of hope for the stock and tech more broadly. However, comments from President Donald Trump after the market close that he would put tariffs on the iPhone drove the stock lower in late trading and that could be a negative for not only the stock, but the broader market. Apple was trading at $171.40, off more than 1.8 percent in late trading. Trump made the comments in an interview with the Wall Street Journal, in which he said he expects to raise tariffs on $200 billion in goods to 25 percent from the current 10 percent. He said it was "highly unlikely" he would hold off as China has requested. Trump also said he would go ahead with tariffs on an additional $267 billion in Chinese goods, if he can't reach a deal with China. He said on consumer goods, like iPhones and laptops , tariffs could be 10 percent to temper the impact on consumers. "I don't know if it's tough talk before sitting down, before negotiating or not, but it's the most hawkish he's sounded on the ability to get a deal done," said Art Hogan, chief market strategist at B. Riley FBR. Hogan said Apple was hit by the news in afterhours trading, but the entire market could react as well since traders have been hoping for a ceasefire when Trump meets China President Xi Jinping later in the week. Apple's Monday afternoon rebound helped lift the broader market to close near highs, Hogan said. On Monday, Apple did more than one flip flop during the trading day. 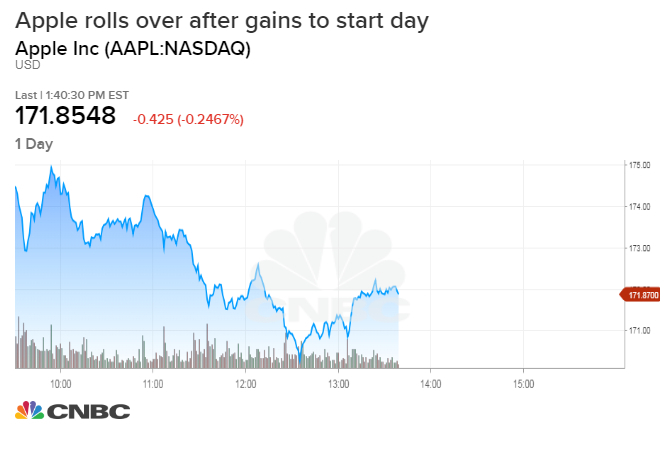 "Apple fell and put a lid on some of the market's gains, but when it reversed at midday, it helped lift the market to close at the highs of the day," said Scott Redler, partner with T3Live.com. The S&P 500 rose 1.5 percent, closing near the day's high at 2,673. Apple was up 1.3 percent at $174.62. "Apple did a stealth reversal today where sellers tried to break it below Friday's lows," said Redler. "Once it stabilized and reclaimed $172.10, the market got stronger, tech started to make new highs and Apple closed pretty well, which doesn't mean it's out of the woods but it did relieve some pressure." If Apple heads lower and breaks $170, it could head toward $165 and be a negative weight on tech. Redler said Monday's action could have been the first positive step for Apple stock, but all bets were off after Trump's comments. At its intraday high of $174.95, Apple, a Dow stock, added 18 points to the Dow, but it's real impact has more to do with sentiment. "I'm concerned about Apple's drag," said Art Cashin, head of floor operations at UBS. "I think the trouble with Apple is it's one failed product away from disaster." Apple has been surrounded by doubt about its iPhone sales, and the stock has lost about 23 percent since the start of the quarter. The S&P 500 has lost 8.3 percent in the same period. Apple was as low as $170.26 per share Monday. Redler said he was watching to see if Apple could get back to $175.50 per share, last Tuesday's low. "It didn't even have the strength to get there, but it took out Friday's low of $172.10 and that was what brought on the [early] selling," he said. But it later broke above that level and moved higher. "Every time the market's tried to rally, Apple's not been the leader. It's been a headwind," he said. If Apple can somehow regain its upswing, Redler said the next level it needs to break is $175.50.